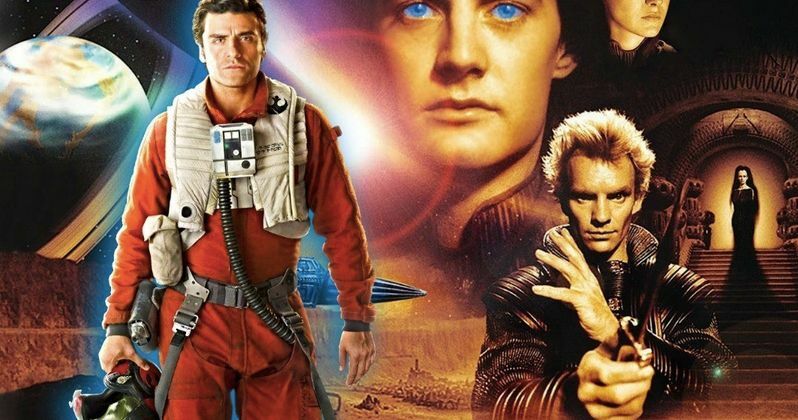 Oscar Isaac is the latest big-name star to board the upcoming Dune remake. Legendary Pictures has been putting this new take on Frank Herbert's legendary sci-fi novel together since 2016, after closing a deal with the author's estate for the rights. Over the last couple of months, the project has been heating up, with the cast starting to take shape, with filming expected to begin in the near future. Now, Isaac looks to be joining an already impressive ensemble. According to several reports, Oscar Isaac is officially in talks to join Dune, which is set to be directed by Arrival and Blade Runner 2049 filmmaker Denis Villeneuve. There doesn't appear to be anything that would get in the way of Isaac joining the cast, in terms of his other work commitments, as his other 2019 projects, such as The Addams Family and Triple Frontier, are in post-production, and filming on Star Wars 9 should be wrapping up sooner rather than later. Outside of those projects, he's got nothing else scheduled, meaning he's free and clear to duke it out with giant sandworms in space. The cast already includes Timothee Chalamet (Call Me By Your Name), Rebecca Ferguson (Mission: Impossible - Fallout), Dave Bautista (Guardians of the Galaxy Vol. 2), Stellan Skarsgard (Thor: The Dark World) and Charlotte Rampling (45 Years). Chalamet has been cast in the lead role as Paul Atreides and, should the deal get done, Oscar Isaac will play his father, Duke Leto Atreides. Isaac is no stranger to sci-fi, having starred previously in movies such as Annihilation, Ex-Machina and as Poe Dameron in the new Star Wars trilogy. Isaac also had a small voice cameo in the hit Spider-Man: Into the Spider-Verse, which is up for Best Animated Feature at the Oscars. For those who may not be familiar, Dune, initially published in 1965, centers on a sprawling feudal interstellar empire in the distant future. In this future, planetary dynasties are controlled by houses of nobility that pledge an allegiance to the imperial House Corrino. The story largely follows the young Paul Atreides, whose family accepts control of the desert planet Arrakis, which is important to the galaxy as it is the only known source of a rare and highly valuable spice drug. The novel has been brought to life before, most notably by David Lynch in 1984 with his movie adaptation and then again in a made-for-TV miniseries that debuted in 2000. Legendary views this as something with franchise potential and they hope that this will just be the first entry in a series of movies based on Frank Herbert's books. Denis Villeneuve is also co-writing the screenplay alongside Eric Roth and Jon Spaihts, in addition to directing. Production is expected to begin in the spring and, for the moment, the studio has not yet locked down a release date. We'll be sure to keep you posted as any further details on the project are made available. This news was previously reported by Variety.